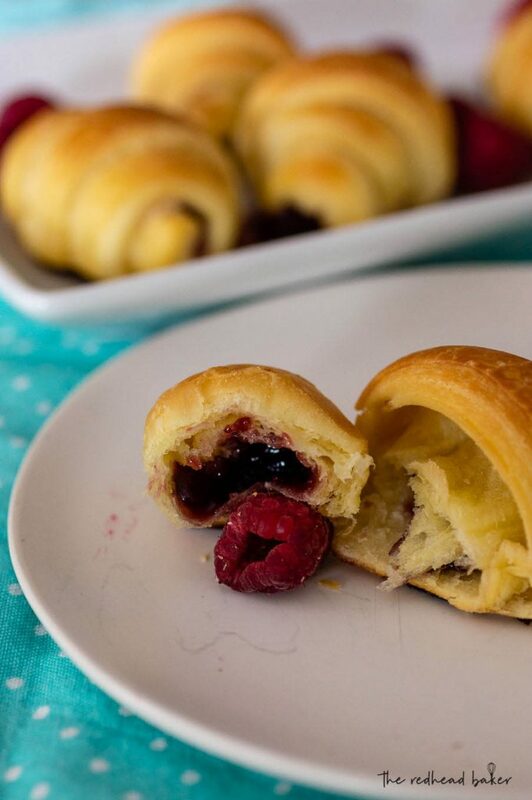 Melt-in-your-mouth buttery brioche crescents surround a filling of sweet raspberry jam. 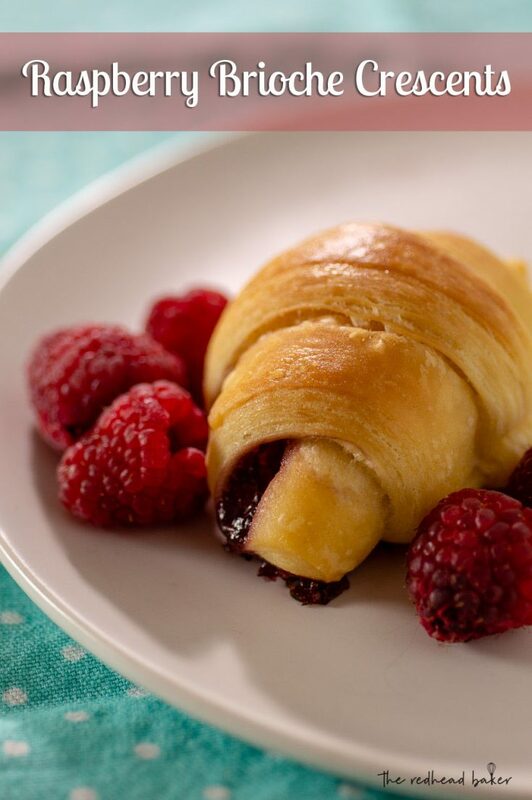 Serve for brunch, dessert, or a mid-day snack! Welcome to this month’s Progressive Eats meal! Our theme this month is eggs. Each recipe is centered around eggs. Brioche, if you’re unfamiliar, is a French yeasted bread that is enriched with eggs. And butter. LOTS of butter. Because of the amount of butter, this bread needs to be cold to be shaped. I like to make this bread over a period of 2 to 3 days, because it keeps the dough chilled, and the cold fermentation makes for better bread flavor. After rolling the dough into a circle, it is cut into long triangles, then wrapped around a teaspoonful of raspberry jam. Actually, you can use any flavor of jam you like, or even a citrus curd. Now, this dough will be unlike most other yeast doughs. It will not form a soft, cohesive ball after it is mixed. It’s not liquidish, like cake batter, either, but it’s softer than cookie dough. You’ll probably wonder how on earth you’ll be able to shape this. All I can tell you is, don’t worry! As long as you follow the recipe, work with chilled dough, and preferably measure your ingredients by weight, it’ll work. 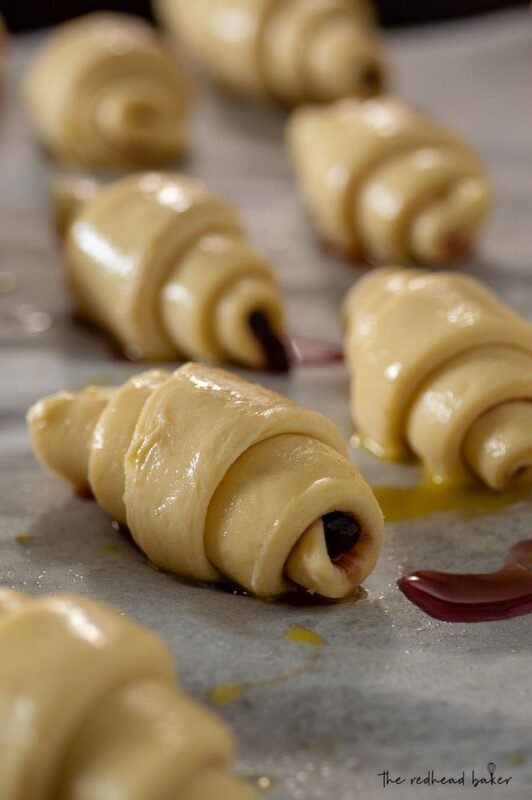 And yes, some jam will ooze out of the crescents while baking. 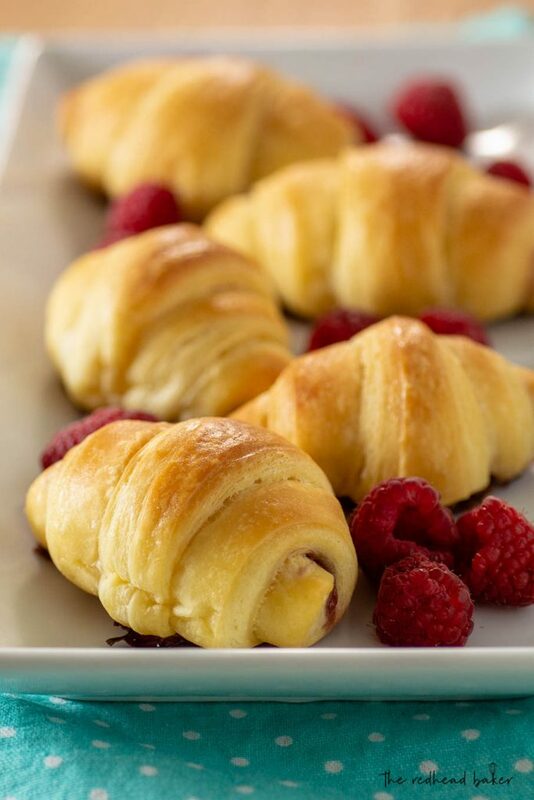 If you think a lot has dripped out, serve your crescents with additional raspberry jam on the side. In the recipe, I proof my shaped crescents overnight in the refrigerator. If you go this route, your crescents will not puff up like dough proofed at room temperature will. They will probably take the full 20 minutes, if not a few minutes more, to bake. Alternatively, you can skip proofing overnight, and proof at room temperature for 90 minutes, brush the crescents with the egg wash (that’s what gives professional baked goods that shiny crust), then proof another 15 minutes, then bake. Check your crescents after 15 minutes of baking. In the bowl of a stand mixer, combine 1/2 cup of the bread flour, plus the yeast and milk. Stir together until smooth. Cover with plastic wrap and set aside for 30 minutes. Add the eggs to the bread/yeast/milk mixture, and beat on medium speed with the paddle attachment until smooth, scraping down the bowl to incorporate all of the bread/yeast mixture. In a separate bowl, combine the remaining flour, sugar, and salt. Add to the stand mixer bowl, and beat on medium-low speed until all of the dry ingredients are moistened. Turn the mixer off, and let the dough rest for 5 minutes. Turn the mixer on medium speed and add 2 ounces of the butter, allowing the butter to fully incorporate. Add another 2 ounces, mix to incorporate, and repeat until all of the butter is added and incorporated. Let the dough mix another 6 minutes or so at medium speed, scraping down the bowl occasionally, until it is smooth and soft. Unlike other bread doughs, it will not form a ball around the paddle that cleans the sides of the bowl. Line a baking sheet with parchment. Mist the parchment lightly with nonstick cooking spray. Scrape the dough onto the parchment, and with wet hands, flatten it into a rectangle roughly 6 by 8 inches. Mist the top with nonstick cooking spray, and cover with plastic wrap. Refrigerate the dough on the baking sheet overnight, or for at least 4 hours. Divide the dough in half. Return one half to the refrigerator. Lightly flour a clean surface. Place the remaining half of the dough on the flour, and dust the top with more flour. Knead one or two times to form a soft disc. Roll the dough into a circle roughly 14 to 16 inches in diameter. Use a floured pizza cutter to cut the dough into 8 wedges, then cut each wedge into two thinner wedges. Take one wedge, and flatten sligthly with your hands, widening the fatter edge of the triange. 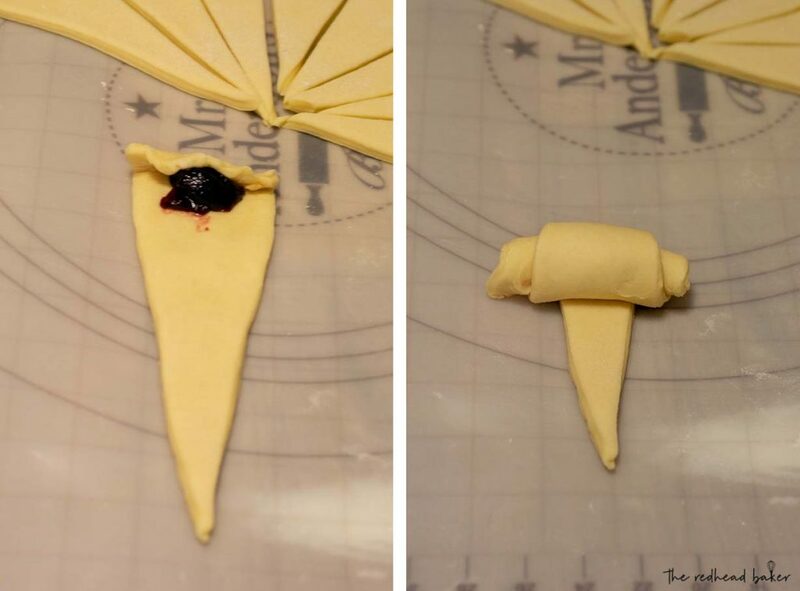 Place 1/2 to 1 teaspoon of seedless rapsberry jam at the wide end of the triangle, then roll the wide end over the jam, and down towards the point of the triangle. Place on the prepared baking sheet, with the seam-side (where the point meets the crescent) on the bottom. Repeat with remaining wedges. Once the baking sheet is full, mist the tops of the crescents with nonstick baking spray, cover with plastic wrap and return to the refrigerator. Let the formed crescents proof in the refrigerator for at least 8 hours. Remove from the refrigerator. Preheat oven to 400 degrees F.
Whisk the remaining egg with 1 tablespoon of water until frothy, and use a pastry brush to gently brush some of the egg wash onto each brioche crescent. Once the oven is at temperature, bake for 15 to 20 minutes, until golden brown on top and the crescents lift easily from the parchment. Cool on a wire rack for at least 20 minutes before serving. Dust with powdered sugar if desired. Oh, my gosh, what gorgeous crescent rolls!! I adore brioche rolls and would inhale way too many of these gems if they were in front of me!! Though, I still MUST try this recipe…. Those look amazing. I’ve always had a love hate relationship with brioche dough. Sometimes it cooperates, and sometimes it doesn’t. I need to try these! Homemade brioche dough – how impressive! And they are absolutely gorgeous – I would inhale the entire batch!! I haven’t baked croissants or brioche in decades but you make these delicious looking morsels sound eminently do-able. Plus your photos make me salivate. So perhaps I should throw caution to the winds and make these for a weekend brunch. What fun! Plus I can almost hear the oohs and aahs when the guests see these homemade delights. These look amazing. I am so impressed by your brioche dough — and how doable you make these sound. Also, the potential raspberry dripping out the side is totally the best part. You have me believing I can make these. I have been working for years to rid myself of my doughaphobia and this post encourages me to give one more type of dough a try! And I love that jam filling! oh my goodness – these look amazing. Brioche is the BEST, and am so impressed you made these! I haven’t made them since culinary school, and need to correct that serious oversight by making these! !